Press Releases – Fasoo U.S.
Fasoo, a leader in data-centric security, announced today that Deborah Kish, former Senior Principal Analyst with Gartner Research Associates, will join the company as executive vice president of marketing and research on April 1. Fasoo, a leader in the intelligent information management market, will demonstrate how content virtualization revolutionizes information management and collaboration at the AIIM Conference being held March 26-28 in San Diego. Fasoo, a leader in data-centric security, will demonstrate its unified unstructured data security and privacy solution at the 2019 RSA Security Conference being held March 4-8 in San Francisco. Fasoo, a leader in unstructured data solutions, has partnered with AIIM to sponsor their latest research report on Automating Governance and Compliance. LAS VEGAS, NV, August 2, 2018 -- Sparrow Co., Ltd, a leader in application security solutions, recently spun off from Fasoo, and is showcasing its application security ecosystem at Black Hat USA on August 8-9, held in Las Vegas. Bethesda, MD, June 4, 2018 -- Fasoo, a leader in data-centric security and content services, announced that it will display its latest unstructured data security and enterprise document platform solutions at the Gartner Security & Risk Management Summit from June 4-6, held in National Harbor, MD. 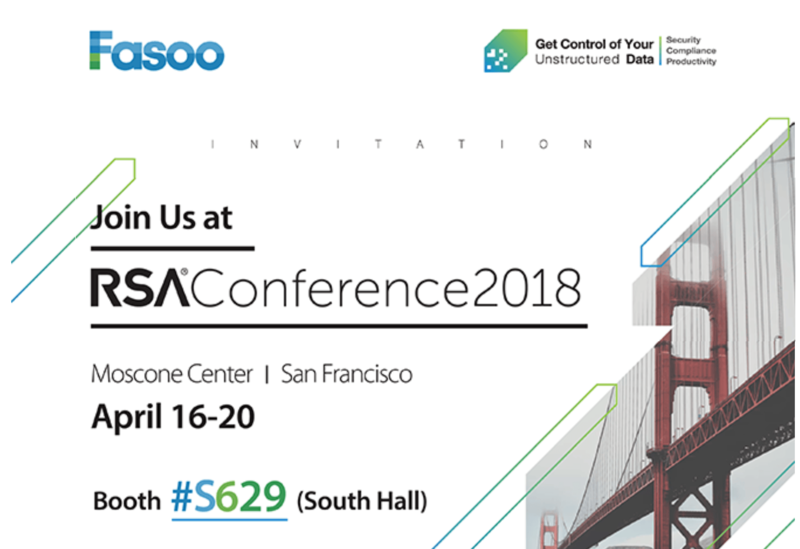 Bethesda, MD, April 17, 2018 – Fasoo, a leader in data-centric security and content services, will showcase its latest unstructured data security and enterprise document platform solutions at the 2018 RSA cybersecurity conference on April 16-19, held in San Francisco. Fasoo will be presenting on how we can help you manage your unstructured data. "October is National Cyber Security Awareness Month, which is sponsored each year by the National Cyber Security Alliance to increase awareness on how to protect ourselves against the loss of personal and business information. 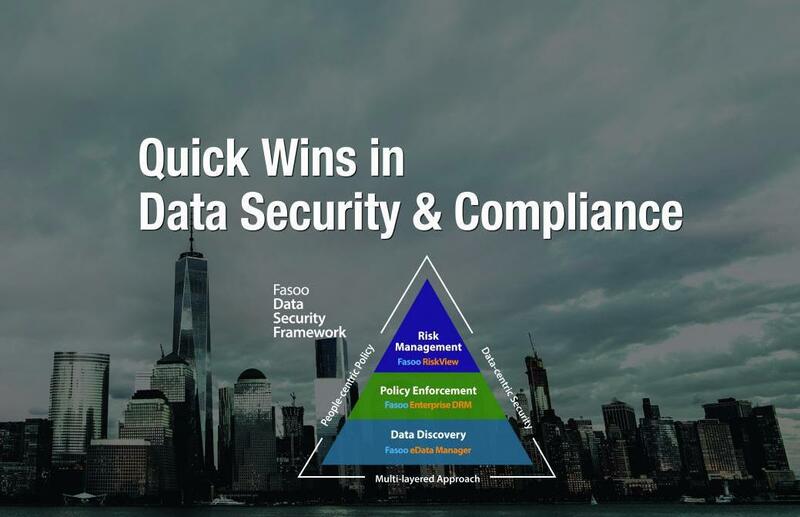 Fasoo, Inc., a leader in data security and compliance, announced that they will be showcasing their data security and management framework which allows enterprises to track, manage and secure their data. The newest version of Fasoo Enterprise DRM builds on Fasoo's three-tiered suite of solutions, used by enterprise organizations around the world, to discover, classify and protect sensitive data as it is created and distributed. Fasoo, a leader in data security and compliance, will join Dr.
As of March 1, 2017 the New York State Department of Financial Services (NYDFS) introduced the new regulation NYDFS 23 NYCRR 500. Fasoo announced today that Info Security Products Guide, the industry's leading information security research and advisory guide, has named Fasoo Enterprise DRM 5.0, a Bronze winner of the 2017 Global Excellence Awards® in Database Security, Data Leakage Protection/Extrusion Prevention for 100-400 employees. Fasoo, the leader in Data and Application Security, announced today at the RSA Conference 2017, that it will promote its newly expanded data security and management framework which enables enterprises to track, manage and secure their data. Fasoo Inc., announced that John Herring has been appointed CEO/President and a member of the company's Board of Directors. Fasoo announced today that Info Security Products Guide, the industry's leading information security research and advisory guide, has named Fasoo Enterprise DRM 5.0 as a finalist for the 13th Annual Info Security Product Guide's 2017 Global Excellence Awards in the category of Database Security, Data Leakage-Protection/ Extrusion Prevention. The National Cyber Security Alliance reminds consumers and businesses to learn about preventing and recovering from tech support scams, identity theft, ransomware attacks and a variety of other cyber threats. Fasoo, Inc., the leader in Data and Software Security, today released the results of the security industry's first look at organizations' confidence around protecting intellectual property and other high value assets. Fasoo, Inc., the leader in data and application security, today announced its sponsorship of a Ponemon Institute survey to determine the readiness of financial firms doing business in New York State to comply with new cybersecurity regulation (NYDFS 23 NYCRR 500).